In the highlighted point, I immediately found myself questioning the aptness of the analogy, if “casinos” are taken as standing in the position of God as the “user” of random events towards a purpose. For actually, casinos use dice precisely to the extent that they are not random, in that their throws form a probability distribution predictable enough to design a game where the house percentages are reliably advantageous. Remember from previous discussions that the only valid meaning of “random” in science is “unpredictable”. But it is the punter, not the casino, whose ignorance of the real situation makes him think he is likely to win by using chance to his advantage. The casino does not use chance (“unknown cause”, by definition), but known probability functions… otherwise, it would not be in business long. But again, if we take this as an analogy for God “using chance”, ask yourself just how valid it is as soon as you make the casino omniscient, as God – except in heterodox creeds – is omniscient. In that case, the casino would no longer even have to work on probability functions, because the house would know what every dice throw will be in advance. Place your bets in an establishment like that, and there is not even a pretence of parity between the risk taken by the house and the risk taken by the punter, because the risk is all on one side. They know all the answers, and you know none… which is grossly unfair in a regulated gambling setting, but maybe not in a theological one, or omniscience would never have been believed to be an attribute of God in any situation. In the specific case of dice – but no more than in evolution, in fact – there is nothing in science to say that dice are unpredictable in principle. They meekly follow the laws of physics from their initial conditions all the way through to their result, as I described long ago in this post. So the omniscient croupier doesn’t even need to know the future to be able to predict from those initial conditions exactly how the dice will fall: he just needs to know the current circumstances exhaustively, which even the Open Theists admit of God. Quite simply, then, an omniscient casino is not dealing in chance at all, but in utter certainty. Which is why you should never frequent a casino whose proprietor is God. But suppose your casino is not only omniscient, but omnipotent? Specifically, suppose that (per impossibile) in the casino the punter, the dice and the game all “live and move and have their being“. It sustains them all in being from moment to moment – it is, indeed the “ground of their being” and the first cause of every other cause in the joint. In that case in the dice game, whenever the croupier threw the dice, he would know, and control perfectly, exactly what he was doing with each muscle. When the punter threw the dice without such power and knowledge, the croupier would not only know, but be intimately involved with, the throw. 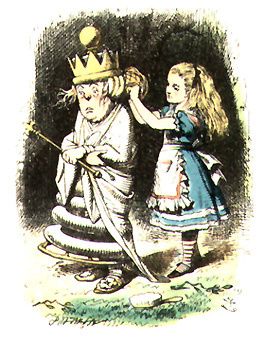 Under such circumstances, the house could no more be involved in the state of ignorance called “chance”, let alone “use it to accomplish a larger intended purpose”, than you are able to find amusement by tickling yourself. Depending what Einstein meant, and what quantum science means, he may it seems have been wrong in his assertion. But it’s a matter of simple logic to say that God does not play dice with himself, whatever he does with the Universe. Recently in discussing providence, and so on, at BioLogos, some people have sought shelter from that kind of logic in saying they are willing to accept mystery and not be too specific in how God relates to evolution. That’s fine if it’s a policy pursued consistently, but in practice it isn’t: to say that “God uses chance” is a VERY specific claim, which is directly contradicted by Scripture, in which God determines the lot, rather than exploiting its probability function. But as we have seen, the claim also entails, for it to mean anything at all, that God be neither omniscient nor omnipotent. On first principles alone, it is a seventh impossible thing for the White Queen to think before breakfast. 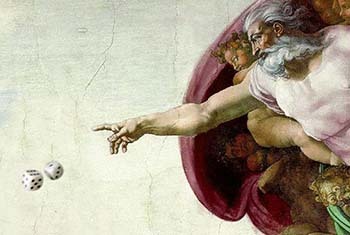 The idea of a non-omniscient and non-omnipotent God playing the odds with probabilities will please the Open Theists, no doubt – but do orthodox Evolutionary Creationists really want to go there? If not, they will have to distance themselves from putting God in any relationship to randomness other than completely above and beyond it. For randomness is nothing but ignorance, and God is ignorant of nothing. But here’s another thought, prompted by Sy Garte’s recent important blog post proposing the evidence of the DNA code as indicating “inherent teleology” in life. I suppose such a proposal is essentially to be classified as “philosophical”, for since Bacon science has excluded “final causation” (partly to spite Aristotle, whose science depended on it), and theology too is capable of conceiving an entirely passive, ateleological nature such as Boyle and his successors championed in the “mechanical philosophy”, in this case to prevent nature stealing God’s glory. 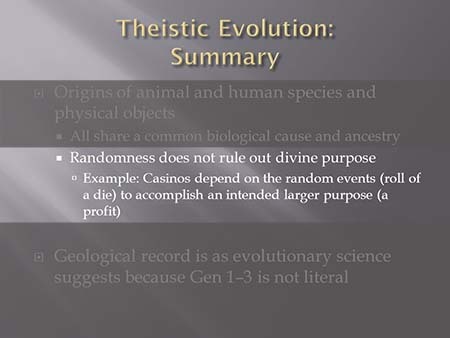 But I suggest that, whatever kind of argument it is, it may help to nuance the “casino” analogy in a way that keeps “chance” alive in evolutionary science without making God subject to it. The whole problem with the gambling analogy is what stumbles so much of the science-faith discussion: and that is univocity. The casino example depends on God’s acting as an agent like the casino-owner in a gamble against the rest of the world (the punter in the case of the casino, and unguided matter in the case of God in evolution). But the inapplicability of that began to be painfully obvious when we started to attribute divine attributes to the casino. As I have tried to show when discussing God’s providence, it operates in a different realm of being from physical processes. God does not “steer” spermatozoa against their nature, but is creatively behind their nature directing them to very specific ends (John the Baptist was my example). 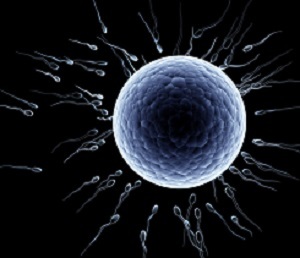 Regarding that example, Noah White asked asked me why it should be that if God directs spermatozoa in such a way (to create each of us as a beloved individual, rather than only biblical characters), they should also be involved in their millions in an apparently random race to fertilize the ovum, the rest being wasted. It’s a very good question, and set me thinking hard. And here’s my suggestion: that we must make sure we keep the divine activity of creation quite distinct from the physical processes of nature, but without denying either. In that view, we must refuse to say that “God uses randomness to create new life-forms”, because God in creation does not use means, let alone incoherent means like omniscient ignorance. However, it would be possible and correct to say, given the existence of inherent telelogy in the evolutionary process as Sy proposes, that “Living things use randomness to diversify their forms”. They (or whatever one conceives as the determining agent of that teleology – it might be molecules, I suppose) are after all, unlike God, subject to uncertainty. Those two separate “sides” of the matter would come together as one event through the concurrence of God with nature. On the physical side is the strategy of spreading your genes amongst millions of sperm in the process of generation for success, or of promoting or permitting your genetics to vary in evolution: and on the Creator’s side the creation of specific and “endless forms most beautiful”. 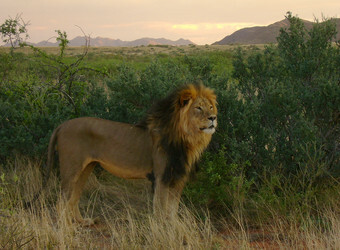 This would be analogous to the way a predator will roam its territory, with limited knowledge, until “by chance” some prey crosses its path; whilst God in Job describes how he will “hunt the prey for the lioness and satisfy the hunger of the lions”. 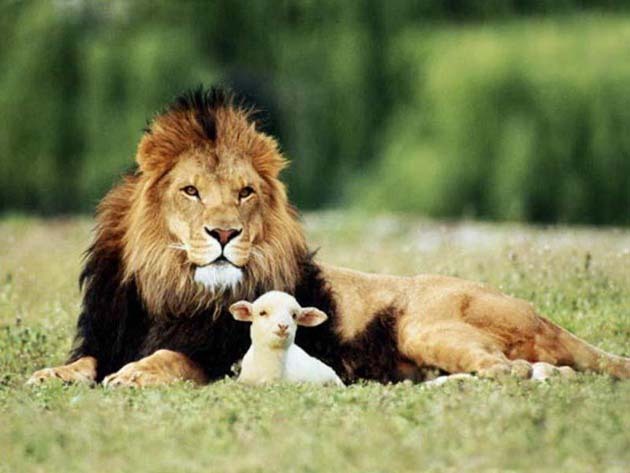 The lion is trusting to chance for its creaturely reasons – God is not, for his divine ones. In this way we can see how the common experience for man and beast in the world of “chance” is retained when we view evolution from the creaturely viewpoint (I’m thinking especially of the idea of life’s teleological, though probably unconscious, viewpoint as described by Sy, more than how things look to the human biologist), whilst we do not belittle our God either by making him a victim of chance (even a calculating one like a casino-owner) nor a mechanical tinkerer with physical things in his sovereign act of creation. That seems to me a real paradigm for understanding “providential evolution” (and it works equally well whatever theory of evolution you favour). But one more thing still needs to be said. I’ve drawn a sharp and clear division between the two terms in “Evolutionary” and “Creation” (or “Theistic” and “Evolution”, if you prefer). In doing so I’ve really abandoned the joint-terms themselves as misleading – there is “evolution”, which is what life does through biology (and maybe even teleological biology), and there is “creation” which is what God does by fiat. He does not create through evolution, so much as creating in concurrence with evolution, providentially, and there’s a difference. But in that case, on which side of the divide does “design” come? In the “omnipotent casino” example, the unsuspecting punter puts himself at the mercy of probabilities. But the winners are chosen by the house, infallibly. The casino plans all the specific outcomes – let us hope it does so in wisdom and justice (or let there rather be no omnipotent casinos!). At least as it is currently understood, evolutionary processes may be adequate to produce outcomes, but not intended, or designed outcomes. But if design is on God’s side of the equation, not the natural side, there is harmony rather than conflict between them. God is the Intelligent Designer (modify that phraseology if you think it too mechanistic) – life is the Blind Watchmaker. “Design and chance meet together; Behe and Dawkins kiss each other.“ Well, probably not – but BioLogians will have no justification for accepting one and scorning the other. As long as you don’t confuse the two, as sadly nearly everybody seems to, you will have a truly theistic evolution. Do I get some kind of award for being given a shout-out in a blog? I feel like I’ve arrived at some liminal moment. But I want to echo and reiterate the thought that if someone uses a tool–especially an omniscient/omnipotent someone–it is fairly logical to assume that they have full control over that tool . Your closing remarks (from my question down, basically) are really, really, valuable and all the more evidence that for those willing to look, providence and evolution are almost made for each other. Also, I started reading this and both Proverbs 22:6 and the Einstein quote popped into my head. I was both pleased to see you’d included them, and disappointed that my two ideas for a pertinent comment were taken away. Something about suns and the recency of things under them, I suppose! Certainly nothing new in the post – just recycling of traditional doctrine . But maybe we always need new ways to look at things for each new age when it’s forgotten.